Jim Corbett National Park, located in Nainital district of the North Indian state, Uttarakhand, is a fantastic destination for eco-tourism. It was established as Hailey National Park in the year 1936, and is considered to be one of the oldest national parks in the country. Every year, plenty of leisure tourists and wildlife enthusiasts visit this region to explore its splendid natural surroundings and diverse species of flora and fauna. This national park is spread over a vast region of more than 500 square kilometres, and comprises of marshy areas, hills, grasslands, and a large lake. It has an elevation of 400 to 1,200 metres above sea-level, and has a dense moist deciduous forest consisting of Mango, Sal, Rohini, Peepal, and Haldu trees. Famous wildlife conservationist and author, Jim Corbett, played a key role in creating this reserve, and this is the reason why it has been named after him. Climate in Corbett National Park is temperate, and is generally pleasant for most parts of the year. Travellers visiting this wildlife reserve can book any of the popular resorts in Corbett to enjoy a memorable stay during their vacation in this part of the world. 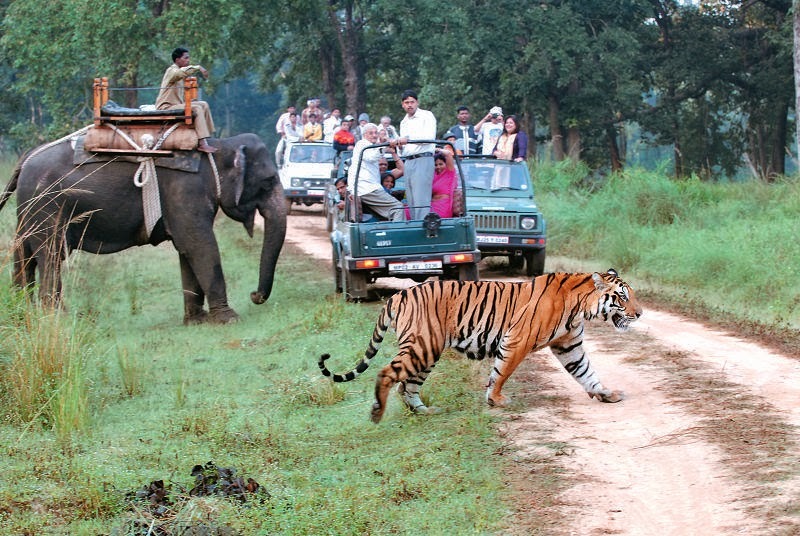 Best time to visit Corbett is from mid-November to mid-January.